Find a balance between healthy and convenient. Eating out is an integral part of our culture. In fact, it is synonymous with celebrations, long and hectic work schedules, or a quick fix when a fast-food run allows for time with family. When eating out is inevitable, knowing where to look for healthy alternatives will help you stay in the vicinity of the healthy-eating path. It’s easier to make healthy food choices when you’re in your own kitchen. The same cannot be said for elaborate restaurant menus or worse, fast-food joints and drive-thrus. Does this mean that eating out is impossible when you are on a mission to revamp your health, lifestyle or budget? “Healthy” catchphrases like “consume fewer processed foods,” “avoid sugars” and “avoid transfats,” fall short in guiding you to make good choices. Some restaurant salads are higher in unhealthy fat and sugar than the bacon cheeseburger and fries on the menu! Menu options created to be appealing can be compromised when it comes to nutritional and ingredient quality. Added sodium, artificial flavors, poor quality cooking oils and lesser quality alternatives for dressings, sauces, cheese and bread find their way into recipes as a result. Healthier options on restaurant menus are trending, but figuring out the recipe and nutritional value is often inaccurate guesswork. 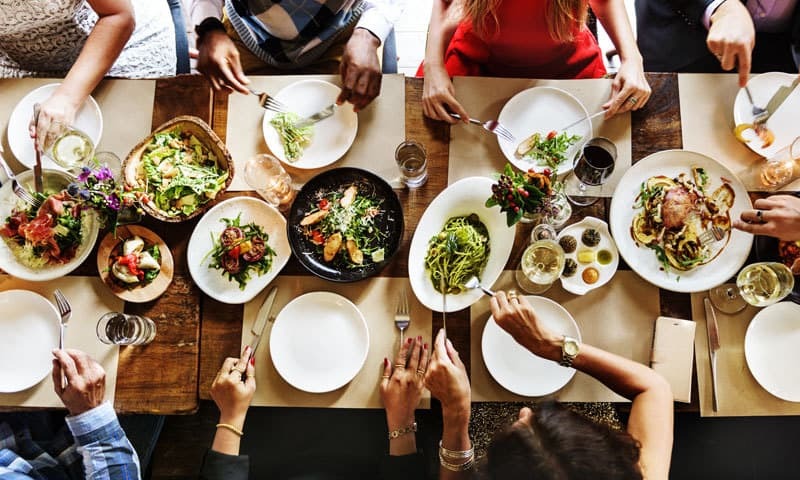 Here are a few simple tricks and tips to eliminate the guesswork and make going out to eat an almost guilt-free experience. • Have a healthy snack. It might seem like a good idea to withhold meals before dining out in order to make room for what’s to come. Unfortunately, studies show that people make poor decisions when blood sugars are low, which can be the case when you have skipped meals. Therefore, consuming a snack, preferably one rich in lean proteins and fiber, before dining out can prevent an unintended binge. Having a healthy snack, such as one serving of nuts or yogurt with fresh blueberries, will help curb your appetite. • Skip the dressing or order on the side. While the most intuitive healthy decision is to order a salad when dining out, it may be best to skip the dressing. Sauces and dressings are loaded with transfats, sugars and saturated fats. Just two tablespoons of ranch dressing can add 150 calories and 16 grams of additional fat to the salad. While the rainbow of antioxidant-rich vegetables and grilled chicken sound like something straight out of a nutrition textbook, premixed salads with dressings are an easy way to consume “hidden” sugars, fats and calories. Stick with an oil and vinegar dressing if possible. • Skip the soup. Like salad dressing, soup, especially creamy soup, is a recipe for disaster if you are struggling to make healthy decisions. While some clear soups made using raw ingredients may be good options, the same may not be true for canned soup or restaurant versions. The reason your favorite bowl of creamy tomato feels so comforting is because the smooth and velvety texture is the result of added cream, butter, coconut milk and cheese. If soup is calling, opt for clear broth-based options such as minestrone. • Skip the bread basket. Consumption of white bread can dramatically affect blood sugar, plus contrary to popular belief, most varieties of bread do not contain much fiber. That means bread can disrupt your digestive system in addition to messing with your blood sugar. However, if bread is an essential part of your meal, choose sourdough. Sourdough bread has been shown to have beneficial effects in the body; it’s also been shown to aid in weight loss. A high-fiber diet reduces the body’s production of insulin and thereby balances blood sugar levels, helping you feel full longer, cut back on cravings and reduce overeating. The fermentation process makes sourdough act like it’s got more fiber than any other bread. • Skip the menu’s healthy options. Be wary of health claims such as “sugar-free,” “low-fat,” “paleo” or “gluten-free.” These labels do not mean the meal or the recipe is healthy. In fact, a sugar-free cheesecake is likely loaded with transfats to make up for the missing sugar. Plus, sugar, fat and salt act as preservatives, lending an increased shelf life to the meal. When one of these essential ingredients is compromised in the name of pseudo health claims, it’s likely that the difference is made up by a less healthy ingredient. • Skip fancy cocktails. Fancy concoctions are loaded with sugar. Alcoholic beverages illicit a short-term “exciting” response in the brain, thereafter resulting in enhanced food cravings as their effects start to wane. Alcohol, upon consumption, is converted and stored as fat in the body. To make matters worse, when alcohol is in the body, it is harder for the body to burn fat. It’s important to remember alcoholic beverages, especially the sugary kind, can meddle with appetite hormones and lead to enhanced hunger and cravings. But, a glass of rosé or white wine serves as a reasonable choice. Darker red wines are calorically dense, so if you’re watching the scale, stay clear of darker wines. Drink a glass of water for every glass of wine or beer consumed to help prevent drinking too many calories and to ward off the next-day hangover. • Skip chips and candy bars. The three pillars of healthy eating on the go are protein, fiber and healthy fats. A good strategy incorporates approximately 5-10 grams of fiber, 10-12 grams of proteins and no more than 350-375 calories per gas station trip. Anchor your attention on protein. Hardboiled eggs (protein plus good fat), lean beef jerky (high in protein, low in carbohydrates), nuts (good source of protein and healthy fats) and Greek yogurt with fruit (protein, good fat and fiber) are wise choices. Pick fresh fruit, no-sugar-added freeze-dried fruit, lightly salted popcorn or pre-sliced refrigerated veggies to add fiber. Individual servings of sliced vegetables with healthy dips like peanut butter, guacamole, salsa and hummus are also good options. Similarly, it is easy to find whole grain crackers and nut butter at most convenience stores. • Skip juice. Juices and flavored drinks may be tempting, but instead choose nutritionally dense options such as milk, no-sugar-added coconut water, hot tea or water. Both juice and flavored drinks can result in elevated blood sugar and insulin, which also results in enhanced fat storage, especially around the midsection. •Opt for dark chocolate. If you must choose candy, aim for antioxidant-rich dark chocolate. Chances are, a decent bar of dark chocolate (70%) will satisfy your sweet cravings and provide you with a much-needed sweet treat. Planning ahead, reading menus, befriending your server and learning about meal preparation should ease the intimidation that might come with dining out.